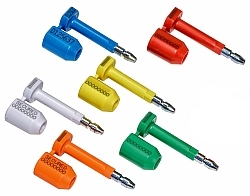 The SnapLock bolt seal features a metal pin and cylinder coated with high impact plastic. The SnapLock is laser engraved with matching serial numbers on the pin and cap. An updated printing location allows visibilty of both numbers after installation. Having each component marked with matching serial numbers eliminates the possibility of component replacement and increased tamper resistance. To further increase security the new SnapLock incorporates an anti-spin feature. After locking the seal, the components are secured in a fixed position providing advanced tamper resistance. The SnapLock bolt seal is the perfect high security solution for cargo containers, truck trailers, or railcars. Stock seals wil be engraved with unique matching serial numbers engraved on the cap & pin. The SnapLock Bolt seal is C-TPAT & PIP Compliant and is rated to "High Security" level under the ISO/PAS 17712:2013(E) Standard. Orders will be packaged 20 per carton, up to 200 per case. For order greater than 5000 pieces please call (630) 584-2918 or email info@securityseals.com for volume discounts.